Baseball is swing…. and you know what that means- ball park franks and Dog Days of Summer around the corner. For going on 5 years now Petco Park has been going above and beyond to shine light on the importance of pet adoption. Every Sunday game the ballpark host their “Petco Park Adoption Sunday” in hopes of giving shelter dogs the exposure they need in the goal to help them find a forever family to call their own. Stop by Petco Park during every Sunday home game to visit with animals from local rescues and shelters presented by Petco. You may just find your newest forever friend. Petco urges you Think Adoption First! 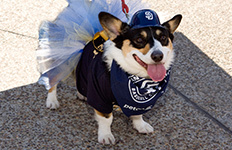 BE SURE TO MARK YOUR CALENDAR: PETCO PARK 2019 Dog Days of Summer, will take place Thursday June 29 at 6pm, when the Padres play the Atlanta Braves! So grab a leash because you and your dog are invited to watch the Padres play for an evening game at Petco Park. An application is required so click here to get signed up! WOOF! What is required? And how do we get tickets to Dog Day at Petco Park?